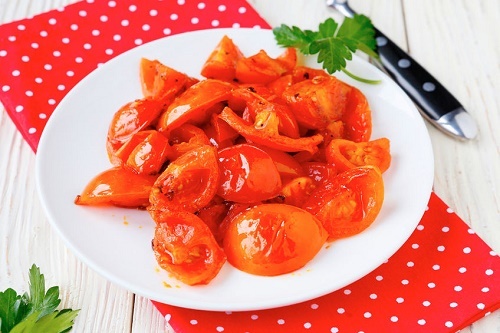 Halve a tomato and place on a baking dish with the cut side up. Dress the pieces with olive oil and sprinkle parsley, oregano, basil and garlic on them. Top each piece of tomato with a half-ounce slice of feta cheese (the fat-free kind) and bake for 20 minutes at 350°F. Broil for another 3 minutes to brown the cheese well, and serve.